I was recently given the opportunity to review a product for She Essential Beauty. This is a truly unique company because they integrate the ancient philosophy of Traditional Chinese Medicine (TCM) with modern research to create organic beauty products using only the purest ingredients. Each product is blended by hand and strives to celebrate your beauty both inside and out. As the goal of TCM is to create balance, so is the goal for She Essential Beauty. Laura Kauffmann and Beth Hooper,the founders of She Essential Beauty, are both licensed acupuncturists and Chinese herbalists. The wanted more from a skincare line so they decided to create a brand centered around the concept of beauty from within mirroring the holistic approach of both of their TCM practices. They chose the Chinese character ShÄ“ because it means luxury and they wanted to convey the high quality of their products. 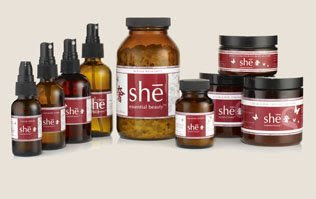 You can purchase directly from the She Essential Beauty website and they accept Visa, Mastercard, American Express and Discover. I was given the opportunity to try the Lavender-Lemongrass Sugar Scrub which is described as a blend of natural sugars, organic oils and Chinese pearl, create an invigorating and aromatic exfoliating treatment that moisturizes, soothes, and tightens pores. Oh my what an experience! I decided to take some quality “me” time and had a nice relaxing bath and try the sugar scrub. It was amazing! It smelled wonderful and I kept thinking wow this stuff smells great! It is exfoliating so when I rubbed it in to my arms and legs, it was like I was giving myself a massage. I bet it would have been even better had I had someone to rub it on my back. I can only imagine how nice it would feel there! I’m going to have to ask my husband to help me out next time! I could tell this was a high quality product and it did not make me red or irritated afterwards. I do have sensitive skin and this product did not cause any kind of reaction with me. I loved that it only has natural ingredients and no chemicals. The holistic viewpoint of this company is something I believe in too. I studied TCM in the past and have a firm belief in its principles. I highly recommend this product whether it be something you buy for yourself or as a gift for someone you love. This particular product that I tried- the Lavender-Lemongrass Sugar Scrub retails for $40 for a good size container 7.75 oz.